Take control of a microscopic army in Grab Games' upcoming RTS. 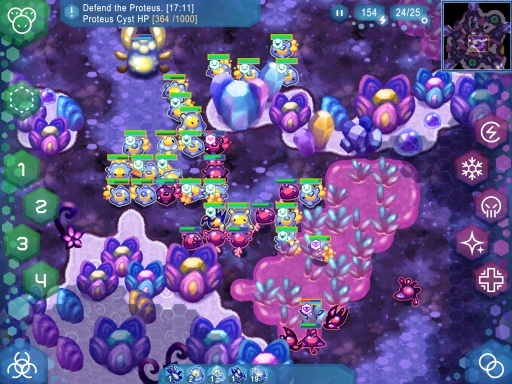 RTS games can be fiddly beasts even with the benefit of a mouse and keyboard, so it's a brave developer who takes on the world of finger-swipes and precision tapping when bringing the world of micro-management and group selection to a touchscreen device. We've recently taken a look at Grab Games' upcoming RTS game Amoebattle to see how they're handling this thorniest of problems. Set within a microscopic world of bugs, germs and nutrients, you're tasked with directing your biological battlers across a series of maps, expanding your unit types and doing battle with the other life-forms attempting to dominate the world of the very very small indeed. 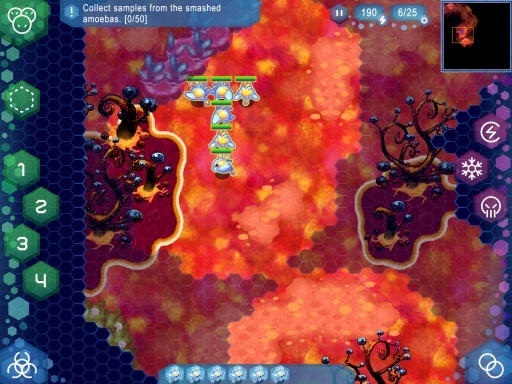 Amoebattle launches on iPhone and iPad next week. Of course, if there's one thing that single-cell organisms are rather well known for, it's their ability to reproduce, and this plays a key part in the strategy of Amoebattle. Beginning with only a small handful of organisms, you lead them around the pond-like play area, stopping only to feed them using the delicious algae nodes that are placed in key areas on the map. 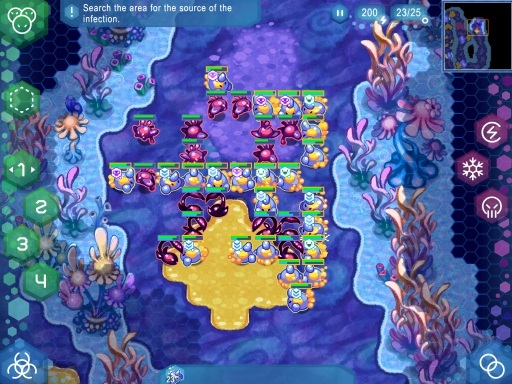 Once each unit has gorged itself completely, the option to reproduce becomes available, although this additionally consumes a resource currency which slowly replenishes over time. The number of units you can have active at any one time is also limited to 25, removing the potential to simply mass-produce and destroy enemies with unbalanced and overwhelming force. Maintaining a balanced selection of unit types is essential for success. These enemies take the form of herbivores, omnivores and carnivores, with each possessing a unique ability. Some may be more suited for long-range combat for example, while others inflict deadly close-quarters damage upon your units. To make things really interesting, units often benefit from the type of ground they stand on, so Wasps regenerate health faster and deal more damage when on grasslands, while your omnivore units fare better in the undergrowth. Drawing enemies out and engaging them in combat at just the right moment is critical to success. The combat is largely automated once the troops face each other, but after you've harvested a certain amount of DNA from defeated enemies, you can analyse the genome of the species and use the information to mutate existing units into the newly-discovered form. It's a neat system that adds a clever layer of strategy to the resource management of the game, and it does so without overwhelming the screen. The interface makes clever use of the available screen space. Having been mutated or created through reproduction, units are selected with either a single press (should you wish to highlight a single soldier), or by simply drawing a circle around a group of units. This latter method is more forgiving than you might fear for smaller devices, and the game does a good job of reading your intended grouping. After selection, units can then be assigned to a handful of hot-keys on the left-hand side of the screen for easy access and tactical control on the battlefield. There are a few minor niggles at this stage of development (we experienced a few crashes and occasionally the game wouldn't progress after completion of a level), but this is a very promising title and one that tackles the hard-wired challenges of mobile RTS gaming with elegance and sophistication. We'll have a full review for you next week.